We're here to get you roller skiing. Established in 2005, we have a growing programme of rollerski instruction and cross-country skiing, and a well stocked online shop for roller ski and cross-country ski equipment. Who are we? 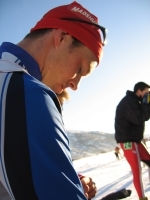 Our instructors come from the world of cross-country skiing, and collectively we have competed at various levels from ski marathons, to national championships to international competition. Our instructors are Snowsport England qualified and have a passion for cross-country skiing and rollerskiiing. (See our profiles for more info on us). What's on offer? We'll get you roller skiing. We provide instruction, sell equipment, and we can get you skiing on snow. No previous experience is needed and we will ensure you master the basics of balance and good technique, whether or not you've skied before. Our aim is to get you skiing as well as possible and as quickly as possible. Our Club provides regular training in London. We offer both classic and skating roller ski instruction and roller skis for sale. Why? Rollerskiing, just like cross-country skiing on which it is based, is great fun. You work for the uphills, and enjoy an exhilarating downhill - a sport, a low-impact way to get fit and lose weight, a good laugh. It's also good cross-training for other sports and is the perfect preparation for cross-country skiing. Who's it for? We've taught a whole range of people to rollerski - from kids to pensioners, hen parties to army ski teams. We take an approach which suits whoever we're teaching. Where? We teach regularly in London's Hyde Park and Victoria Park. We also run 1-day courses at Dorney Lake near Windsor, Redbridge in Essex, Castle Combe in Wiltshire and Ascot. See our venues section. We can can be booked to come and teach groups at local venues across the country (and bring our rollerski hire equipment with us). Ski clubs arrange races and training events across the country. 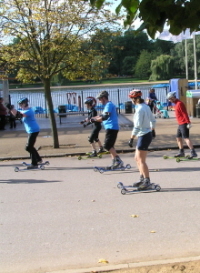 Additionally, people can rollerski at cycle circuits, such as Hillingdon in London and on cycle tracks such as the Bristol-Bath cycleway. In addition we now run biathlon courses, combining roller skiing and shooting. Why haven't I heard of rollerskiing before? Good question. It's been around for at least 5 decades, and in the 1980s 100+ people took place in a rollerski race in Battersea Park. The Princess Royal gave out the prizes. But most of the competitors were from the armed forces. Snowsport England and the various ski clubs in Great Britain have offered rollerski racing and courses for years, but never really promoted them. We have tried to communicate the benefits of rollerskiing better, to a wider audience and bring many more people into the sport. Why cross-country skiing? Cross-country skiing is at one level the toughest, most physically challenging strength endurance sports there is, while at another level it is a gentle way of exploring beautiful Alpine or Nordic countryside in the snow. Don't think of cross-country skiing as an alternative to downhill skiing - better to regard it as a winter equivalent of cross-country mountain biking or trail running. You work for the uphills, enjoy the downhills, and speed through tight forest tracks, amid beautiful scenery. If you do a race, such as a ski marathon, then it becomes even more exciting. And it's accessible to anyone - just jump on a cheap flight to the alps or Scandinavia. If you can do some rollerskiing, you will really make the most of what cross-country skiing has to offer. We hope you enjoy our website. If you have any questions, please get in touch,, our email is info@rollerski.co.uk.